Travel Costs > How Much Do Amtrak Tickets Cost? Amtrak operates intercity railway lines all over the United States. This government-operated train company currently covers a network of 500 destinations across the country, with the service concentrated within major corridors along the West and East Coast. The tickets for Amtrak are available directly via the company on its official website, at the Amtrak stations, and via travel agents who contract with Amtrak to offer service to their customers. How much do Amtrak train tickets cost? The cost of Amtrak tickets, just like an airline ticket, will greatly depend on the seat selection, the train, time of year/day, the destination and the seats you choose. A single Amtrak ticket can cost from $6 to $29 one-way, but it can be over $1,000 for long destinations and premium seats. On average, most trips that are under 500 miles will cost about $40 to $300 per seat in the coach section. To find out what your exact train trip will cost, refer to this Amtrak.com pricing page. NOTE: These are the starting rates for the saver and value tickets. These prices will increase by more than 40 to 150 percent when upgrading to a flexible or premium ticket. WanderU, for example, offers fares for popular destinations, with many fares ranging from as low as $27 to $146, with tickets ranging from $5 to more than $1,028. The average train ticket price, according to the website, is $140. 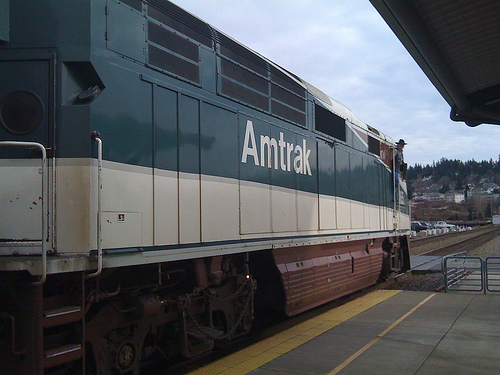 There are some locations that Amtrak doesn’t go to, so a bus, an option often provided when booking a ticket, or a taxi fare may have to be included in the total cost. Upgrading your seats from coach to premium seating or a roomette or bedroom could be an additional $200 to $600 per ticket. Again, this cost will depend on the factors mentioned prior. Tickets are typically refunded up to 24 hours prior to departure; however, if it isn’t canceled before departure, a 10 percent fee will be charged after the 24-hour window has expired. A $20 excess baggage fee will be charged for each carry-on and personal item that is above the quantity and size limits. Travelers are allowed to carry two items, and each bag must be less than 50 pounds and must be smaller than 28 x 22 x 14 inches. Pets are allowed, up to 20 pounds, and will cost $25 each. To date, Amtrak serves more than 179,000 train routes, connecting more than 900 cities in two countries. Tickets can be purchased over the phone, online or in-person at any of the Amtrak stations. Booking online is recommended for convenience. Most tickets are entirely refundable until they are physically printed out. Therefore, it would be best to wait until departure day to request your printed ticket so as to avoid the likely hassle. Amtrak is a government-owned passenger rail corporation in the U.S. It was founded in 1971 with the aim of retaining the national train travel as a mode of transportation. It operates passenger service on over 21,000 miles of track which connects 500 destinations in 46 states as well as select Canadian cities. While Amtrak is no longer mandated to operate nationally, it has managed to retain most of its original routes from the early days of operation. In terms of safety and efficiency, Amtrak is one of the best options in transportation in the United States. It also has maintained a decent reliability record and a strong safety record with some routes being much more reliable and efficient than others. Does Amtrak have WiFi? Most trains do offer free WiFi, but to be certain, you can see if your favorite train offers this feature by searching here. Amtrak recommends arriving at least 30 minutes before your train departs. Check out eBay for vouchers that may be up for sale to drastically bring down your costs. The best way to save money, according to experts, is by booking close your date. While this can be risky on some routes, it can often save you up to 20+ percent. Amtrak provides a rotating series of weekly discounts and these limited-time specials offers can save you a considerable sum of cash on select routes. Be sure to like them on Facebook and sign up for their email newsletter. Children up to 12 years old will cost 50 percent less than an adult fare. Senior citizens older than 62 years old receive a 15 percent discount. AAA members can receive up to 10 percent off. Students, as part of their Student Advantage program, ages 13 to 25 years old, can receive a discount of up to 15 percent off. Veterans can receive up to 15 percent off. Sign up for the Guest Rewards program if you’re a frequent traveler. This program allows you to earn points and travel perks, similar to that of an airline loyalty program.